Description: Picture taken by Steve Gliscinski. Description: Warbonnet working in IHB's Blue Island Yard. Description: BNSF stack train detouring through Bayside Yard. Description: A nice BNSF hybrid paint job on this B40-8W. Description: An eastbound train with a BNSF Warbonnet 8-40BW in the consist passes through Schuyler. 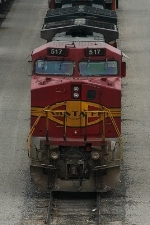 Title: Warbonnet on the lead! Description: A vehicle train moves past one of the many fields in the Red River Valley being prepared for the summer growing season. Description: Warbonnet leads Q380 through some flurries on the Batavia, NY siding at CP 406. Description: The Madison Turn exits the TRRA Merchants Sub at Grand Ave. on its way to the BNSF Lindenwood Yard. The last loco in the consist is the Respondek loco lettered for the Wabash, Pacific and Frisco. Description: A Westbound glides through Maiden Rock, Wi. on the BNSF St. Croix Sub. Description: Crossing the St. Croix River. Title: BNSF 517 Aurora Sub. Description: Between Assignments At La Crosse.